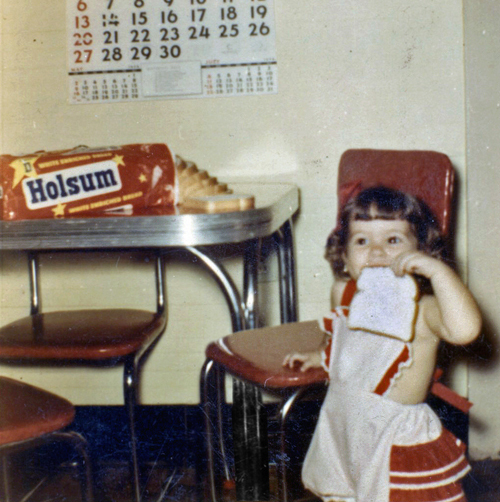 My sister and her Holsum bread, June 1954. Holsum in Arizona was bought by Flowers. When they did that they dropped the Holsum brand. Was this a regional bread? Never saw it in NYC that can recall. The Holsum bread bakery in Tampa was on Hillsborough Avenue and 22nd Street, across from the Sears Roebuck. Every year, Holsum would decorate with Christmas lights. People would line up outside in the evenings to tour the bakery, visit Santa, and best of all, get a free, fresh mini-loaf of Holsum bread.